This pattern combines rotary-cut piecing and very easy paper-piecing, allowing you to achieve perfect points every time! The pattern comes with one master copy of the paper foundation. Full color instructions. Paper-piecing experience recommended. 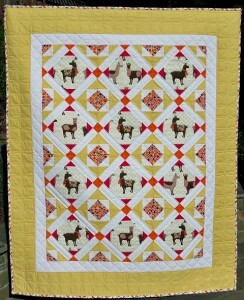 Check the Gallery for this pattern made up in Laurie Wisbrun’s “Holiday Llama Love” fabric for a darling holiday throw! Showcase a fun novelty print! 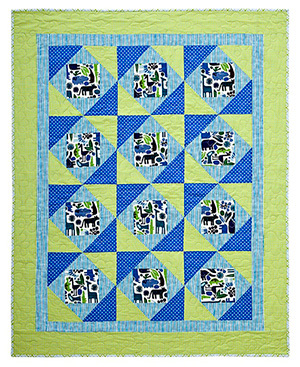 This contemporary children’s quilt is a wonderful project to learn piecing skills, or for use in projects requiring quick and easy piecing. This pattern is template-free and rotary cut. Full color instructions. 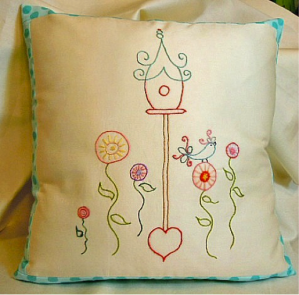 This pattern provides a stitching layout and complete instructions for construction of a 14″ x 14″ pillow, including step-by-step instructions for installing a zipper. A color and stitch guide is included as well if you want to use the stitches and colors shown in my sample. Shipping is by USPS First Class shipping. Please contact us if you require expedited shipping or shipping to an international address. $60.01 and up Free shipping!